Protesters at the Occupy Montreal site tied themselves to a tent as one last stand against their imminent eviction from the Victoria Square encampment, which ended peacefully. Protesters at the Occupy Montreal site tied themselves to a tent as one last stand against their imminent eviction from the Victoria Square encampment, which authorities shut down on Friday. Nine people tied themselves to the kitchen tent in the square and chanted at police, who eventually ripped down the sides of the structure to move protesters out. Police eventually removed the protesters — including a man dressed as Batman who allegedly tried to hug an officer. Police say 16 people were evicted from Victoria Square, but no charges will be laid. While protesters weren't quiet as police and city workers moved in to their camp, they didn't interfere. The full-scale eviction comes one day after protesters were given a second notice that they had to vacate the square. A few dozen tents remained at the site Friday morning. 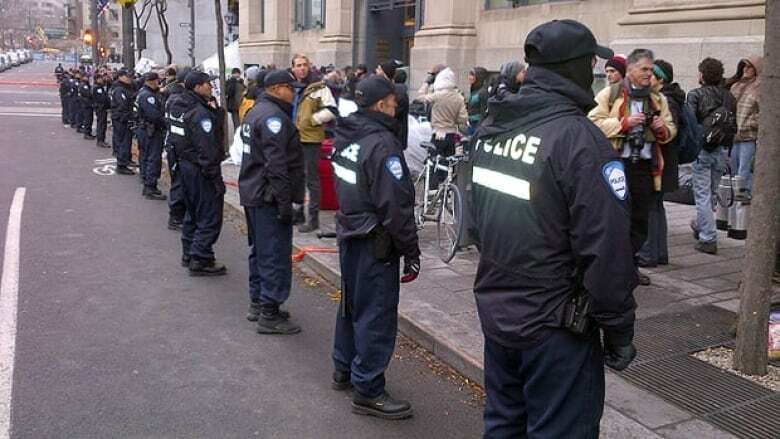 Montreal police started blocking off streets and moving in on the site in the square, where Occupy movement supporters set up camp in mid-October, at around 9 a.m. ET. They ripped up tent pegs and pulled out poles before city workers moved in and starting loading items into a dump truck. An area was set up for people to claim their belongings once the cleanup of the site was complete. Protesters watched from the sidelines, chanting and jeering at police. They didn’t interfere with the operation, however, and no arrests have been reported. The protesters had been negotiating with the city and hoped to be able to remain for one more night in advance of a rally set for Saturday. "Our understanding is that they’re going to clean up the place generally today and leave the tents in place for the people who want to sleep over for the big event we’re having on Saturday," protester Vincent Boissinneault said before the police moved in. Occupy protesters in Quebec City, evicted from their encampment earlier this week, said they will continue to make their voices heard after losing their permanent base. About 70 people marched in the Saint-Roch neighbourhood Thursday, chanting and handing out pamphlets criticizing bank fees and high interest rates. Police kept a close eye on the gathering, but there were no incidents or arrests. P.O.V. : Is it the beginning of the end for Occupy Canada? Opinion roundup: What has the Occupy movement accomplished?